Worried about your skin getting damaged from harmful gulal and holi colours? The festival of Holi is near, as it will be celebrated throughout India on March 21, 2019. Whenever we think of this festival, the first thing that comes to our mind is not only the vibrant colours that you play Holi with, but also the dangers associated with them. 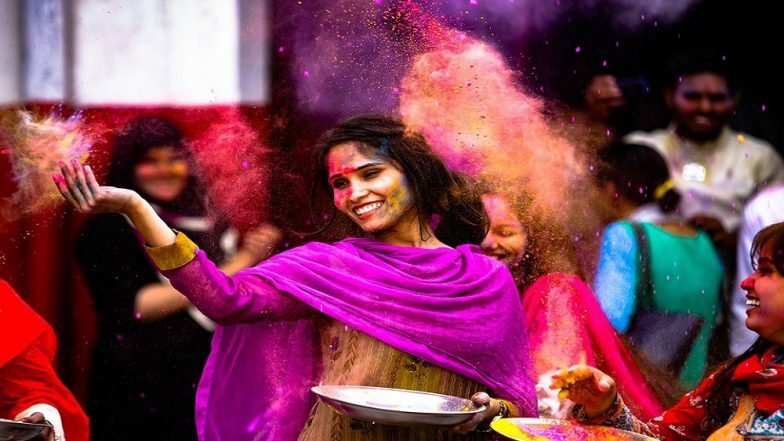 Happy Holi 2019: 5 Must-Visit Places in India to Celebrate the Festival of Colours. In olden days, Holi was played with colours made from flowers and herbs. However, these days ready-made colours are used, which contains artificial substances that are toxic for the skin. The artificial dyes present in these colours can make your skin dry and break into a rash. It's important to protect your skin from the harmful effects of the colours. Chemicals can easily penetrate through dry skin, to keep your skin moist, apply coconut oil on your entire body an hour before playing Holi. After oiling your body, apply gel-based waterproof sunscreen lotions on your skin. It is recommended to use SPF 25+ sunscreen. It is also advisable to re-apply the cream after three hours after sun exposure. If you get wounded while playing Holi, make sure you wash that area immediately and apply an antibacterial lotion. It is also recommended to take tetanus injection in such a cases. It's diffifult to understand t the difference between natural colours and dye. If plan on buying herbal colours from a shop, be sure to check its authenticity. The best advice is to make natural colours at home with flowers like tesu or genda, or one can even use beetroot juice. Curd will help in keeping your skin moisturised; ; the colour will fade away soon. It is advisable to apply curd on the face at regular intervals while playing Holi. Dehyration can lead to dry skin, which makes it easier for colours to penetrate into your skin. So drink clean filtered water while playing Holi. Also, remember to wash your hands properly before drinking or eating anything. Festivals like Diwali and Holi come with a lot of excitement, but it can be spoilt if proper measures for the celebration are not taken. You may be eagerly waiting for the big Holi get together with family and friends, however, be sure to take precautions.